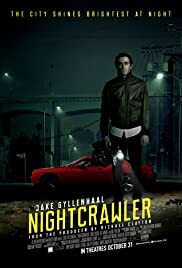 If you take the slick look of Drive and the satirical wit of Network, you get Nightcrawler. This film is a genius first film for director Dan Gilroy, it is darkly comedic, surprisingly disturbing and is brilliantly acted. The film tells the story of Lou Bloom, a freelance videographer who covers the crime world in LA for a local news station and ruthless editor played by Rene Russo. It isn't before long until Bloom's demented job overtakes his life, making him colder and colder the deeper he goes. The film plays like a twisted bloody version of Network and has the satirical wit to back it up. Jake Gyllenhaal is utterly fantastic in this film. Lou Bloom is a role that he is completely submerged in and it oozes through every frame as our dislike for Bloom intensifies throughout the film. But what this film does best is not make us particularly like Bloom but it makes us wonder what he is willing to do next. And trust me, his actions get as sick and as shocking as they come. Bloom is a depraved individual and Jake Gyllenhaal deserves a hell of a lot acknowledgment for this role because he pulls off the tricky task of making the audience care about a character that is truly unlikeable and does so with not one false note. It is truly mesmerizing to see. The supporting cast including Rene Russo and Bill Paxton are absolutely great in this film and deliver career bests here. The cinematography also is top notch here, blending the awesome pallets of Drive with a bitter cold makes for an engaging view and makes it hard for you to peel your eyes from the screen. Writer/Director Dan Gilroy is someone to watch, especially coming out of the gates with a film filled with sheer and raw velocity like this one. It is not only an impressive first film but a brilliant film all around. I highly recommend it.